Chiropractic is a specialty of healthcare that uses no drugs or surgery to heal the body. Instead, chiropractic care consists of spinal adjustments, muscle stretching, rehabilitation, and physical therapeutics such as ultrasound, ice, and muscle stimulation administered by a chiropractor. Chiropractic adjustments can also be used for joints elsewhere in the body, such as the knees, hips, shoulders, and even the tempromandibular joint (TMJ). When most people think about chiropractic care, they associate it with low back pain, neck pain, pain after a car accident or work injury, and headaches. These are, in fact, the most common reasons people seek care from a chiropractor. Also, most research that has been conducted on chiropractic treatment has been on its effectiveness for the treatment of these conditions. However, chiropractic care can be used for a wide variety of joint related problems and conditions. Carpal tunnel syndrome, tennis elbow, hip bursitis, and shoulder pain are just a few of the other conditions chiropractic care is commonly used to treat. Chiropractic works through its positive effects on the nervous system. The nervous system controls the function of the entire body, from the muscles to the organs, and even the immune system. The nervous system is protected by the skull and the spinal column, which is composed of 24 movable vertebrae. When the vertebrae lose their normal motion or position, it can irritate the nervous system and cause problems throughout the body. Chiropractic treatment restores normal motion and position to the vertebrae, and, therefore, removes irritation from the nervous system. Chiropractic care’s positive effect on the nervous system is what allows chiropractic to work for a wide variety of conditions. By normalizing the function of the nervous system, problems such as irritable bowel syndrome, restless legs syndrome, and even asthma can show improvement. 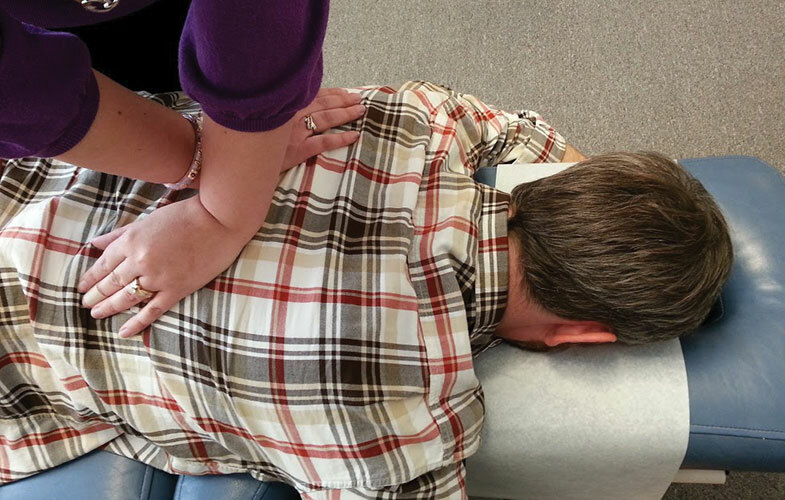 There are many types of chiropractic adjustments. Dr. Emily Brueggeman utilizes both traditional chiropractic adjustments and newer, more gentle, chiropractic adjustments. With traditional chiropractic adjustments, there is often some bending or twisting of the spine, and often a slight noise like a pop heard. Other techniques that Dr. Brueggeman uses are more gentle, require no twisting, and no popping is heard. These gentle adjustments provide the same relief, but there is often less soreness after the treatment. These gentle adjustments are especially good for people in severe pain, people nervous about being adjusted, and people with conditions such as fibromyalgia, severe arthritis, and osteoporosis. To make an appointment, please call us at 618-692-0000 or contact us.